Many people are familiar with American Commodore Matthew Perry’s expedition to open trade relations with Japan in the early 1850s. Less well known is that on the heels of the Perry squadron followed a Russian expedition secretly on the same mission. Serving as secretary to the naval commander was novelist Ivan Goncharov, who turned his impressions into a book, The Frigate Pallada, which became a bestseller in imperial Russia. 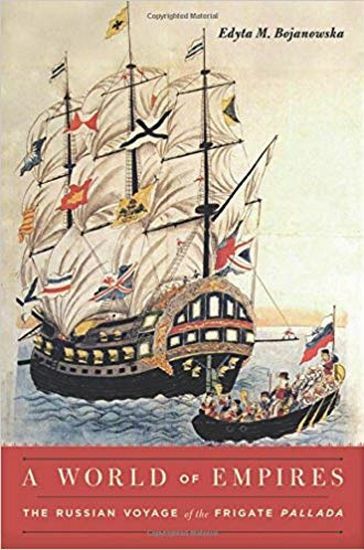 In A World of Empires, Edyta Bojanowska uses Goncharov’s fascinating travelogue as a window onto global imperial history in the mid-nineteenth century. Slow to be integrated into the standard narrative on European imperialism, Russia emerges here as an increasingly assertive empire, eager to position itself on the world stage among its American and European rivals and fully conversant with the ideologies of civilizing mission and race. Goncharov’s gripping narrative offers a unique eyewitness account of empire in action, in which Bojanowska finds both a zeal to emulate European powers and a determination to define Russia against them.